Review posted April 23, 2018. Greenwillow Books, 2017. 36 pages. Here’s a picture book for kids about the enormous numbers in our world. For example, there are about seven billion five hundred million (7,500,000,000) people on earth – and they weigh about the same amount as the approximately ten quadrillion (10,000,000,000,000,000) ants on earth! There are about three hundred seventy billion billion gallons of water on earth, and about three trillion trees. In the course of an average lifetime, you might eat up to 70 pounds of bugs. By the time you’re done reading this book, almost every single number in it will have changed, getting bigger or smaller right before your eyes. Even the number of stars. These numbers are sort-of-definitely-ALMOST true. Let me explain. Some of these numbers change so quickly that to give you an exact number would be impossible. For instance, we don’t really know if the full weight of all the ants on earth equals the full weight of humans. But we can estimate that there are 3.5 million ants per acre in the Amazon rain forest. With some serious snooping, fact-checking, and extrapolating we can estimate a very large number of ants on earth, one that means the combined weight of all these ants should be near the combined weight of all humans, or maybe dogs, or mice. And yes, you might eat some of those ants. you might eat many different types of bugs – though of course I don’t know exactly how many, or whether you’ll do it on purpose. Maybe a fly will zip into your mouth as you bike, or you’ll swallow a spider while you snore at night. But it will be near 70 pounds’ worth over the course of your life (about the total weight of a golden retriever). Estimates can help you imagine sizes and compare one big fact to another. 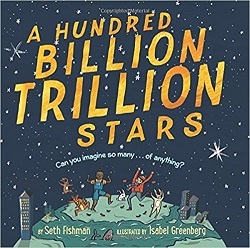 That is why this book is called A Hundred Billion Trillion Stars, and not One Hundred Nineteen Sextillion Fifty-Seven Quintillion Seven Hundred Thirty-Seven Quadrillion One Hundred Eighty-Three Trillion Four Hundred Sixty-Two Billion Three Hundred Seven Million Four Hundred Ninety-One Thousand Six Hundred Nine Stars. We can get very near the correct number on many things, near enough for us to understand how big they are – especially in comparison to the world around us. Here’s a lovely way to play with the concept of great big numbers all around us.